In Maine, the leaves have begun to turn and there is no mistaking the transition from summer to autumn in the garden. Although I love fall, I’m not quite ready to see summer go. 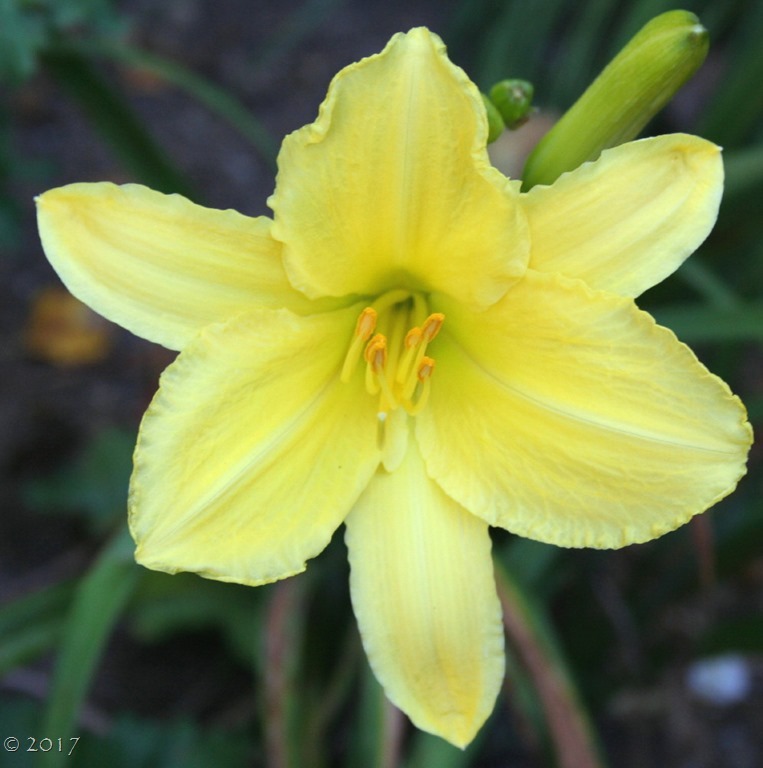 The daylilies that filled the garden with color in July are mostly gone, with just an occasional bloom on one of the late-blooming or re-blooming varieties like Lily Muster, Final Touch, Rosy Returns or Sandra Elizabeth. 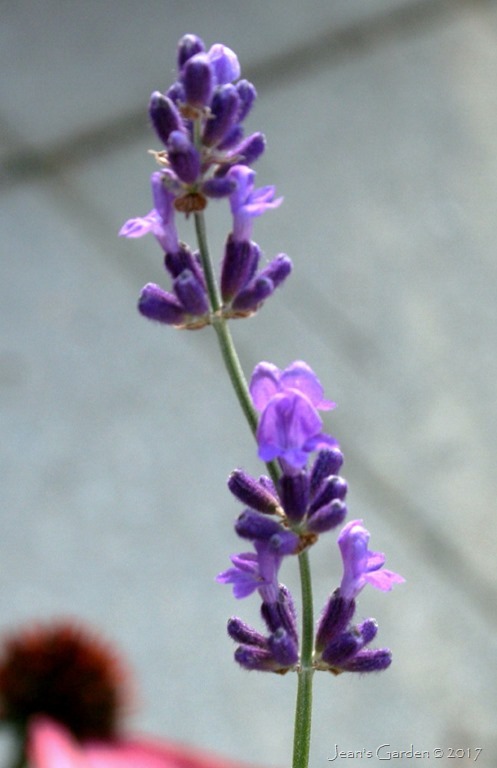 Lavender also continues to bloom, but much more sparsely than it did in July. 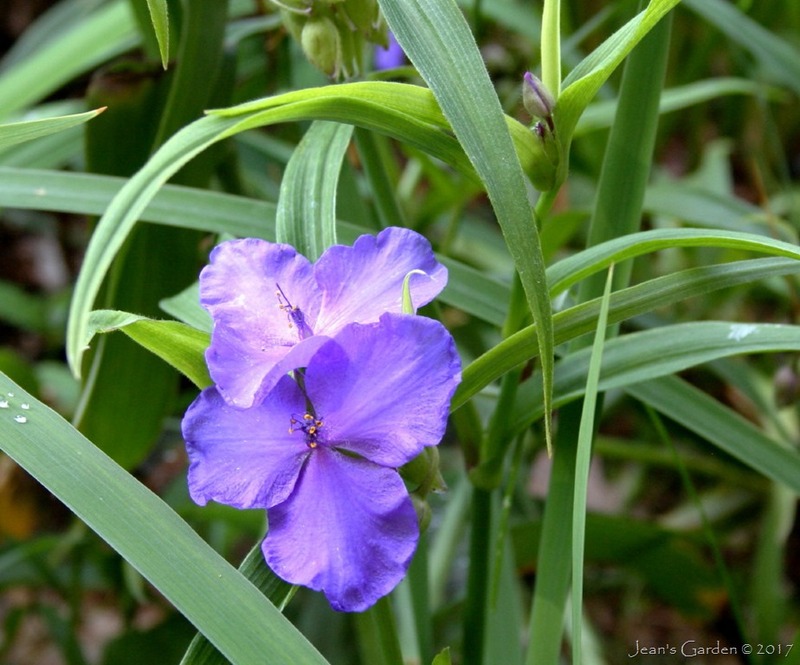 In most of the garden, Tradescantia virginiana has died back, but on the side slope it continues to put up new growth and make new flowers. Other summer flowers are making a better show in September. 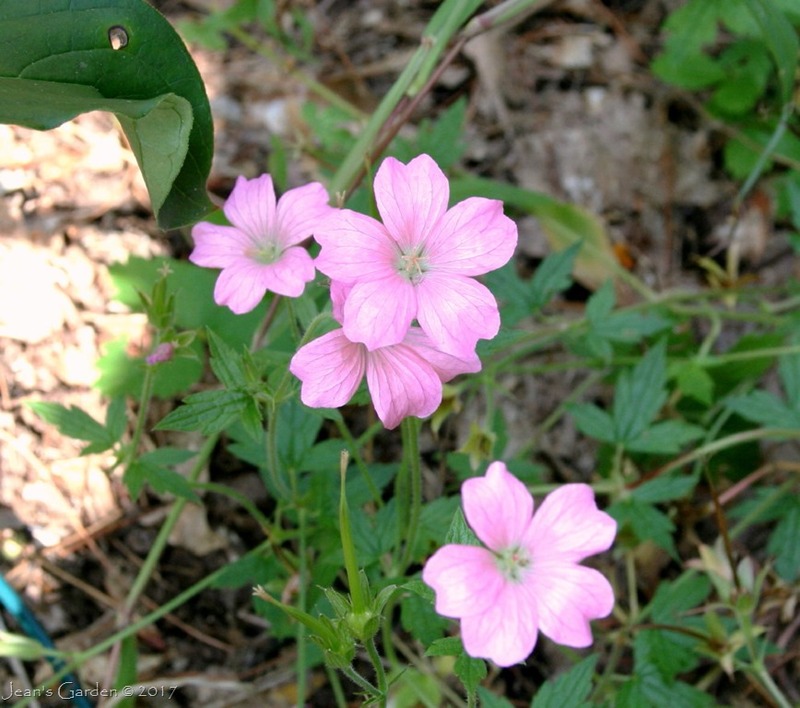 The beautiful clear pink flowers of Geranium x oxonianum, which loves Maine’s cool climate, have been blooming continuously since June. 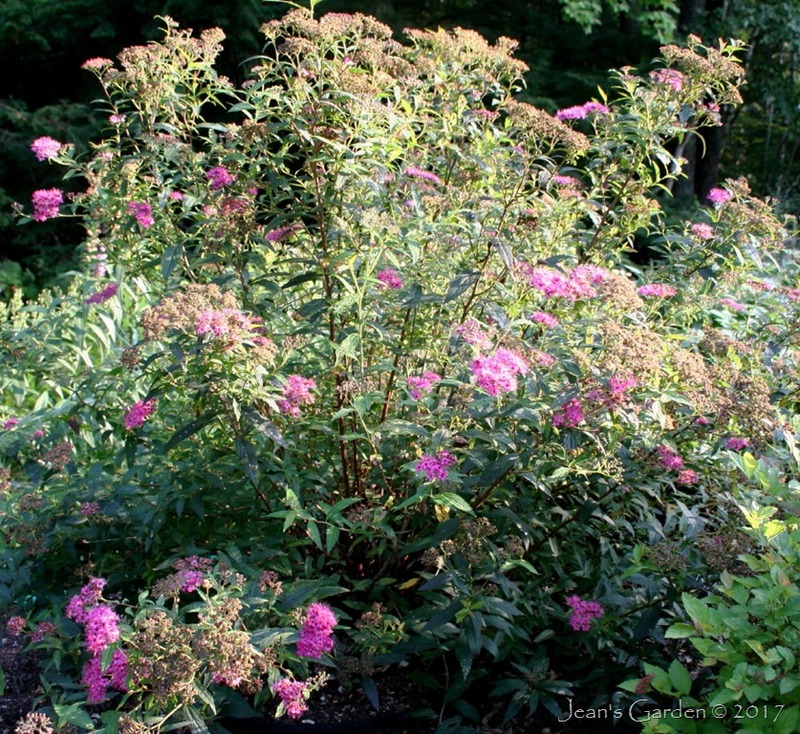 Spirea x bumalda ‘Neon Flash,’ added to the garden last year at the top of the side slope planting, has turned out to be a star, putting out a flush of new blooms just as most of the flowers growing around it are fading. 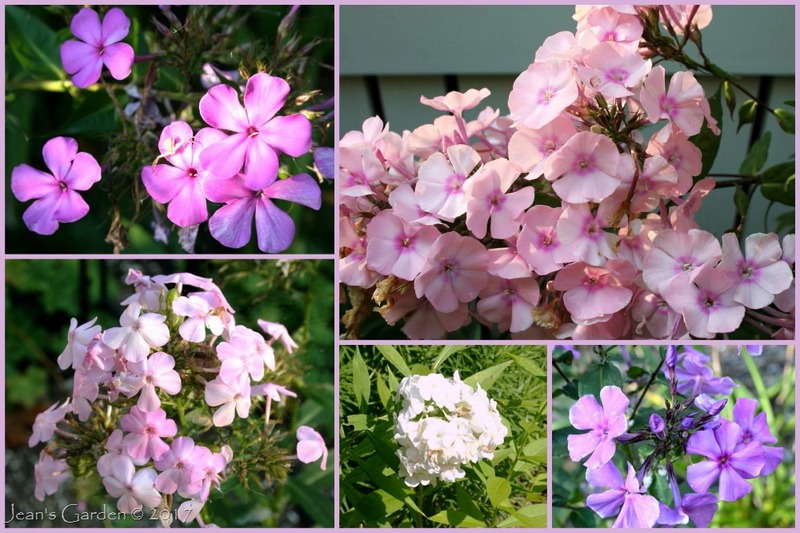 Most of the summer phlox varieties that graced the garden in August are still hanging on, but their flowers look faded and blowsy. 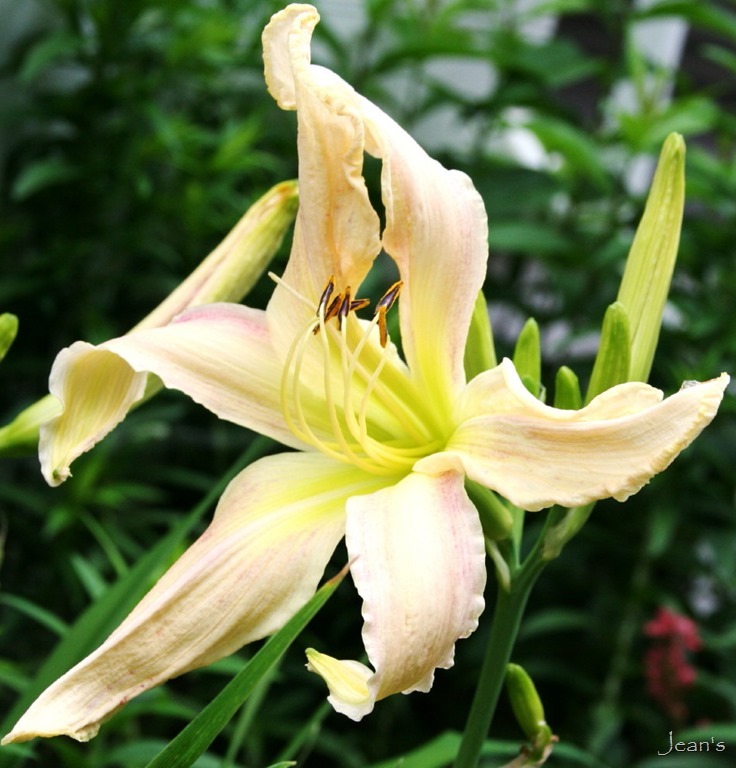 Over the years, I have added fall-blooming flowers to the garden. 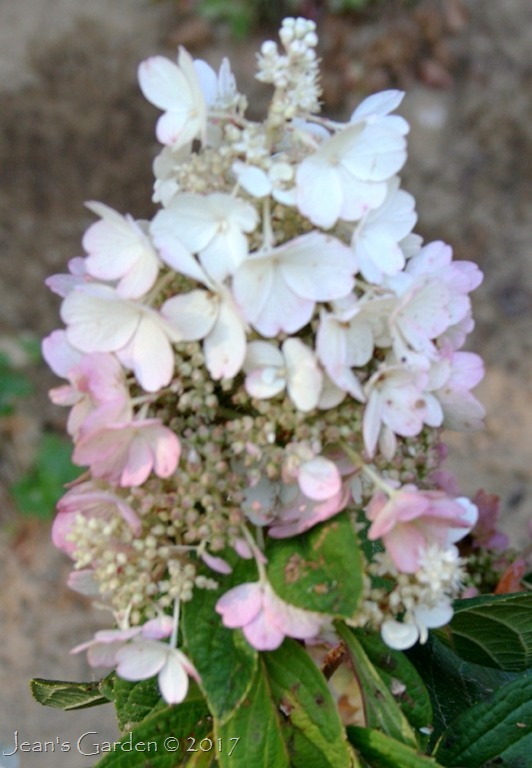 The latest addition is the Hydrangea paniculata ‘Pinky Winky’ planted in the new rain garden. 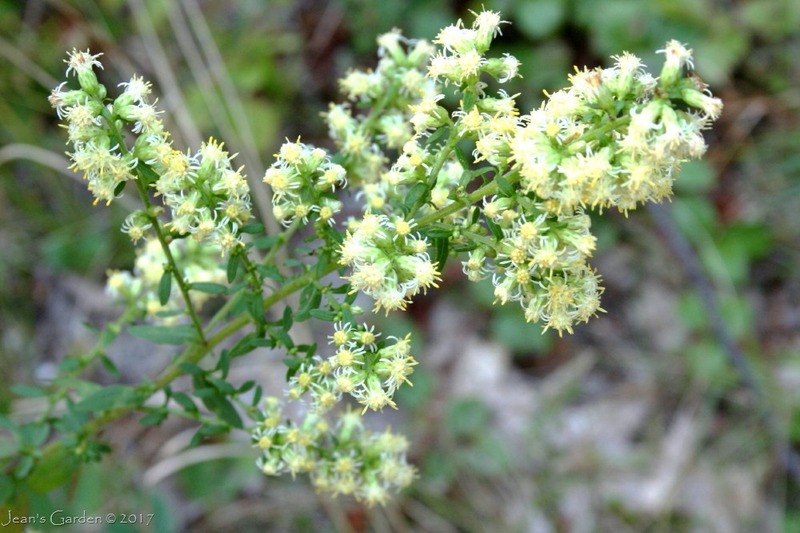 Although it is still quite small, I am enjoying its elegant flowers (which deserve a more dignified name). 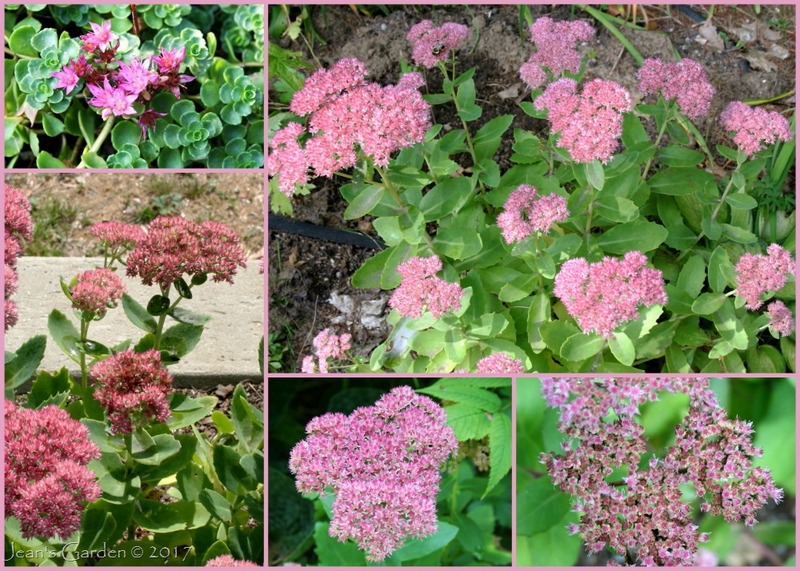 September is the time when the sedums come into their own. 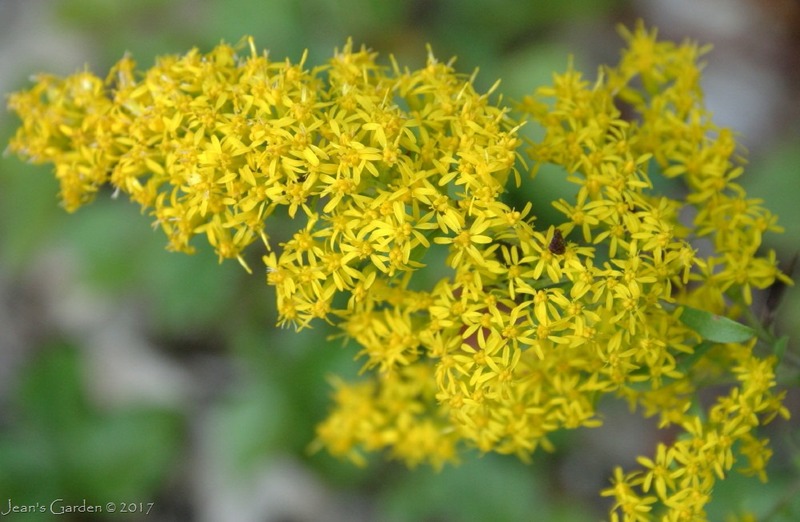 The groundcover sedum ‘John Creech’ has been blooming for more than a month, but the taller sedums have just begun to flower. 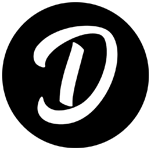 As their flowers mature they will first become more intense and then darker in hue. By October, most will be the color of wine. 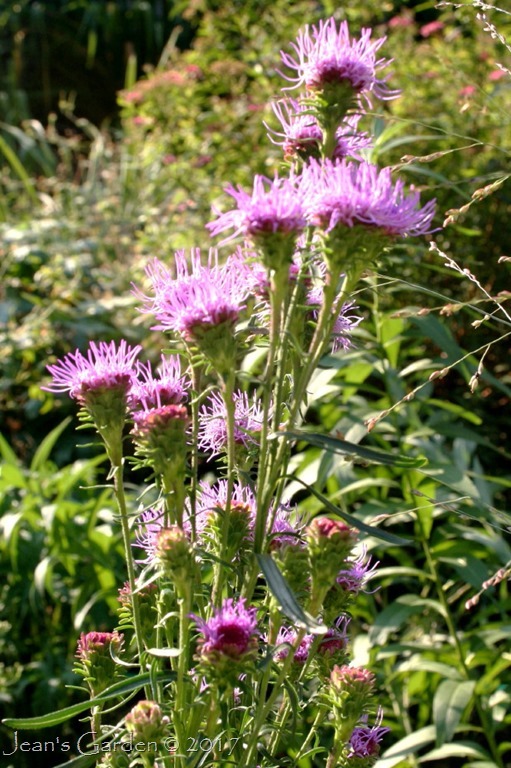 The real stars of the fall garden, however, are all the varied members of the large Asteraceae (composite) family. Some of these have been planted in my garden; others are wildflower volunteers growing around the edges of the garden. Outside the boundaries of the garden, this is the season for goldenrods and asters. I confess that I don’t always have the patience to key out and properly identify the many species of these plants growing on my property. 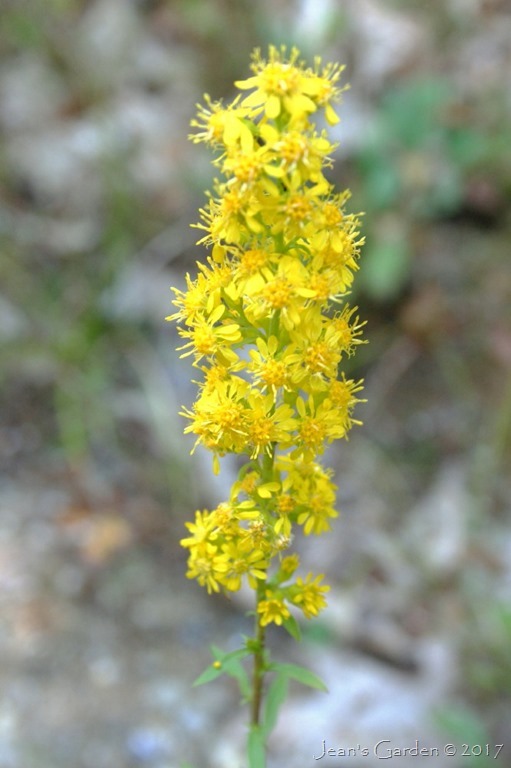 I’m not sure which one this is, although I’m reasonably certain it is a Solidago. 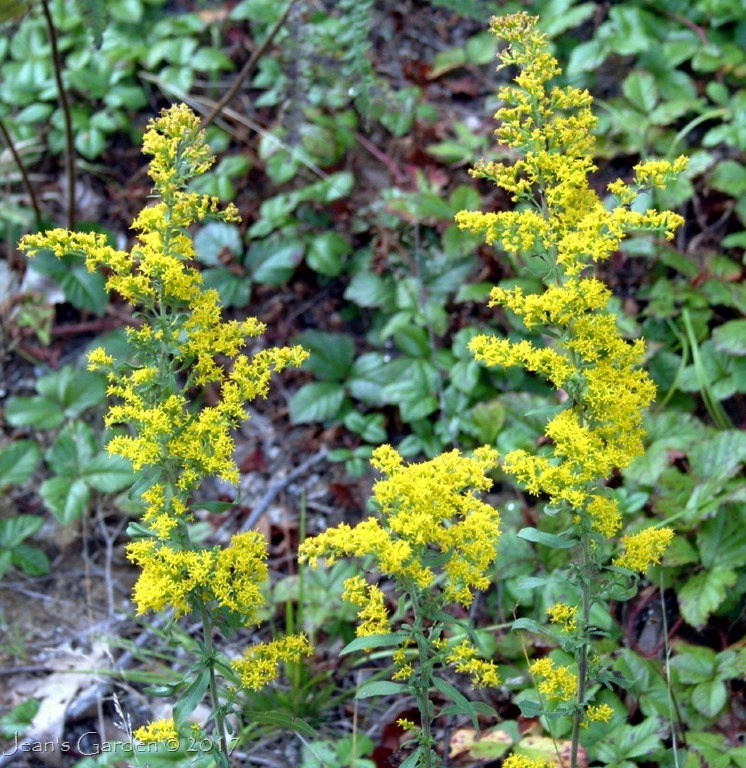 The more easily identified species below are Solidago bicolor (silverrod) on the left and Solidago squarrosa, with its characteristic narrow, upright inflorescence, on the right. 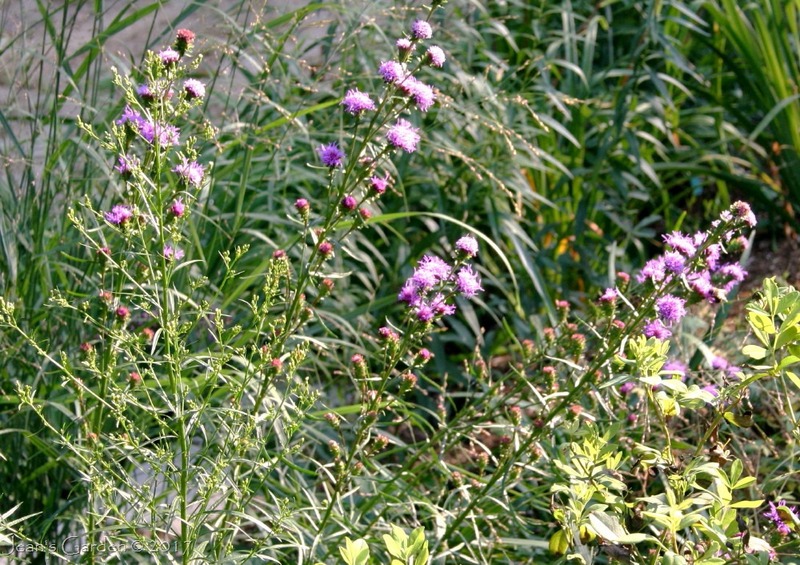 I find the myriad asters even more confusing than the goldenrods. 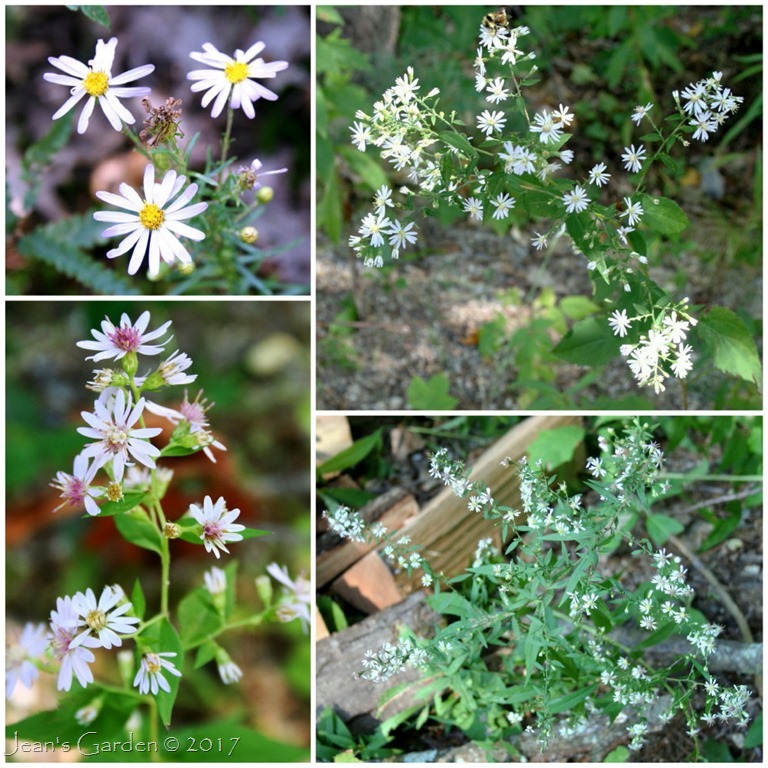 The easiest to identify is the stiff, flax-leaved aster (Ionactis linarifolia) which grows enthusiastically and blooms profusely in my sandy soil. This has lovely lavender flowers, which the camera has had trouble capturing. I am hoping to establish some of this in unamended soil at the bottom of the front slope planting that is next year’s big garden project. 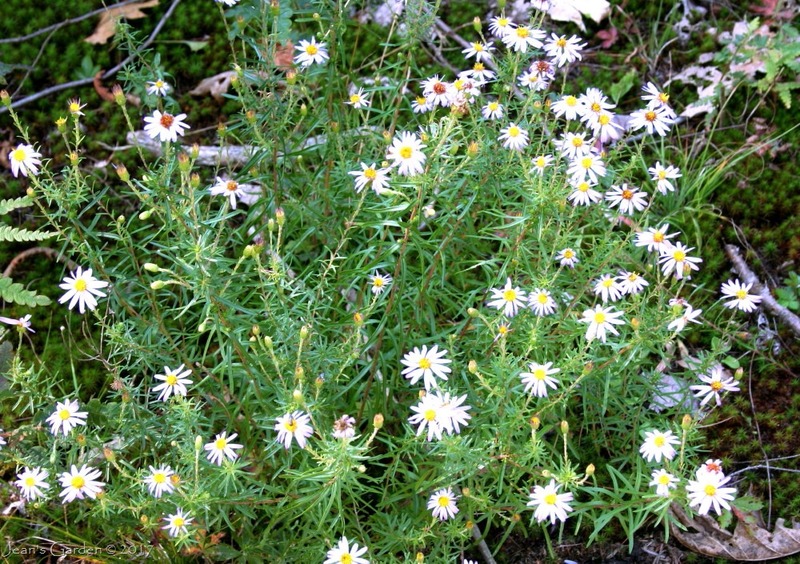 Several other aster species grow at the edge of the woods along the side of the driveway. 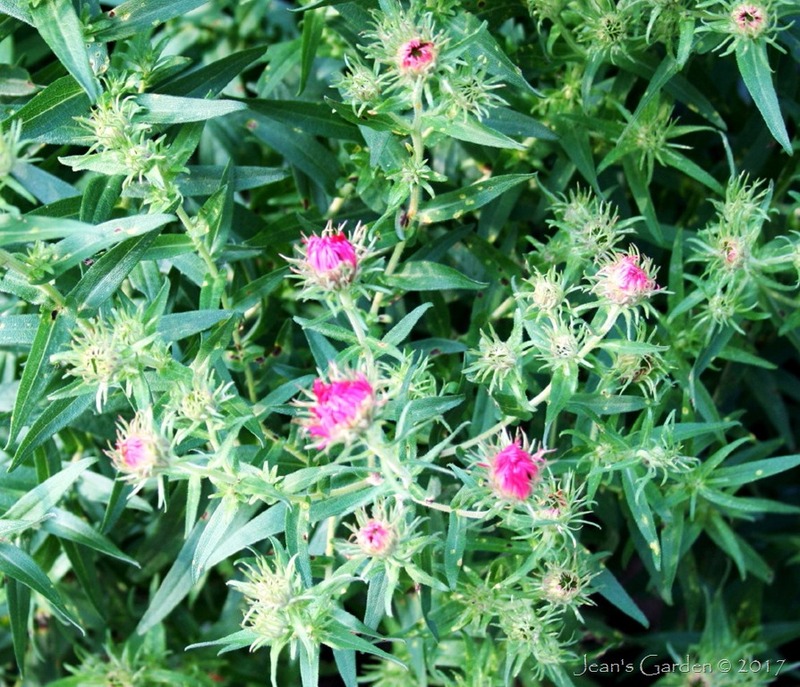 The wild New England asters (Symphyotrichum novae-angliae) in my neighborhood have not yet begun to bloom. 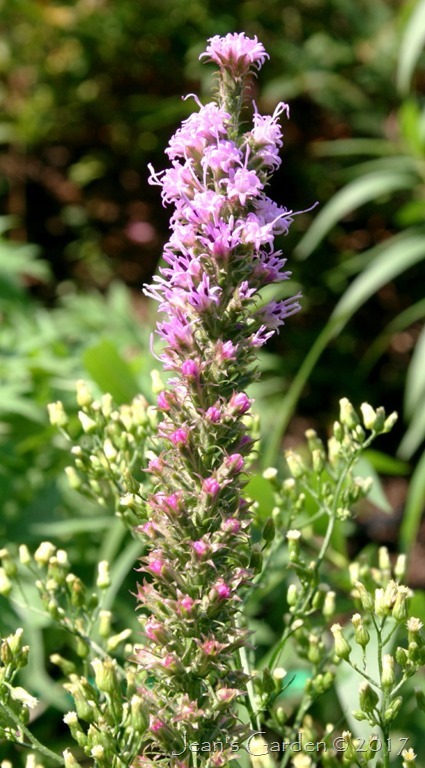 But in the garden, the popular cultivar ‘Alma Potschke’ is just beginning to open her buds. Garden Bloggers’ Bloom Day is hosted on the 15th of each month (although some of us are habitually late to the party!) by Carol at May Dreams Gardens. 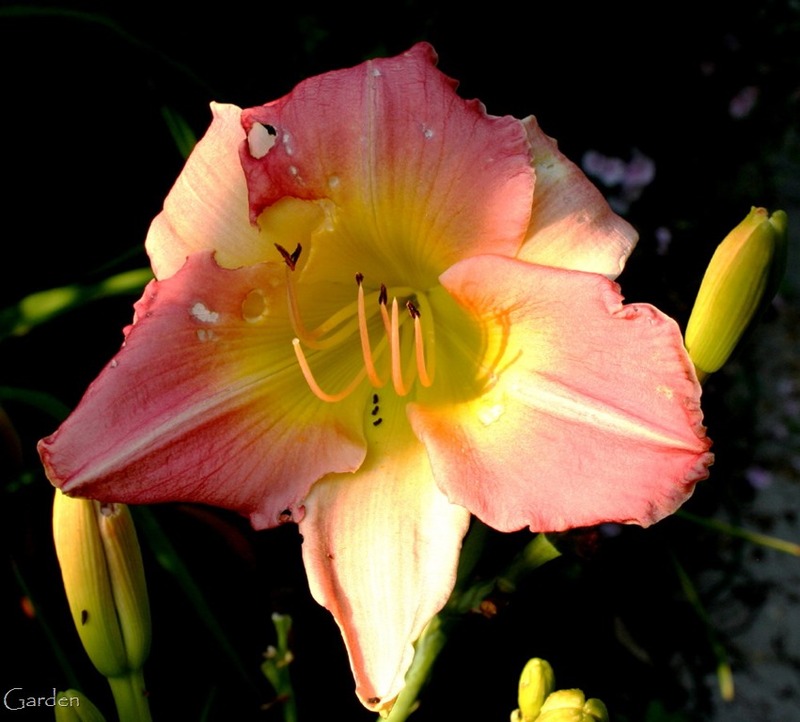 Visit her blog to see September blooms from far and near.